At Eastern CT State, a dozen students are interested in helping lead dorm-based Bible studies in just the third week of this chapter plant. At the new chapter plant at Rhode Island School of Design a Buddhist prayed to Jesus for the first time. At Roger Williams younger students are stepping up in leadership and evangelism after a strong class graduated last year. At Smith College, community members and volunteers served ice cream to 360 students (over 13% of the whole campus) while staff and student leaders worked the crowd and collected contact info from 150 students. At Connecticut College, ten of the 17 students coming out to Bible study are freshmen who are inviting their friends to come too. At Mount Holyoke, a sophomore (in middle of photo) gained a vision to start a Bible study for first year students. At the second meeting a seeking first year was overcome by God's presence during the prayer time and said "I don't know who I am in Jesus yet, but I feel like God is giving me love and hope." At one college, 200 students (1 of every 8 students on campus) came through an interactive survey where the gospel was shared, even with the college president! At least a dozen students have made solid commitments to follow Jesus for the first time so far this year, and staff and students are following up with dozens more who have responded to calls to faith! Year after year, ServeUp always proves to us that it is worth the work we put into it. Students experience God is ways that we just are unable to do back on campus. Last semester, a shy student leader and myself walked into a room of 115 sorority women to share with them about Greek IV. We both were nervous, but took a step in faith and made the announcement and passed out spiritual surveys. We were astonished to receive back 8 surveys (this is a record at UConn!) saying girls were interested in learning more about Greek IV and who Jesus is. One of those women was, T., a Sophomore who grew up in the church, but like most freshman fell away from her faith as she entered college and joined her sorority. T. and I began to meet weekly last semester and we talked bout how amazing it would be to start a Bible study in her sorority house. This semester (which just started) T. has joined our leadership team, she has invited 6 of her sisters and a fraternity man to come on our spring break trip, ServeUp, where they will all hear the gospel... AND next week we are starting a Bible study in the Pi Beta Phi house! Praise God for new student leaders and for their hearts to reach their friends. Pray with me that T. will continue to grow in Christ's love for her sisters and for her protection as she takes major steps of faith in a hard to spiritually dark place. This past year, we have started something called a Servant Leadership Team within Greek IV. This is for students who are a part of our vision and want to see it lived out on campus. This semester we have been studying what it means to be a servant leader and how Jesus is the perfect example of being just that. This week we are looking at and praying through the Litany of Humility from Cardinal Merry de Val (1865-1930). This is a powerful prayer that makes you say, "ouch!" as you read it. I want to invite you to be praying this prayer with us throughout this semester. I am praying that God will continue to transform my heart and my students hearts as we long to see students lives transformed, Greek systems renewed and world changers developed. Click HERE to read the Litany of Humility with us. 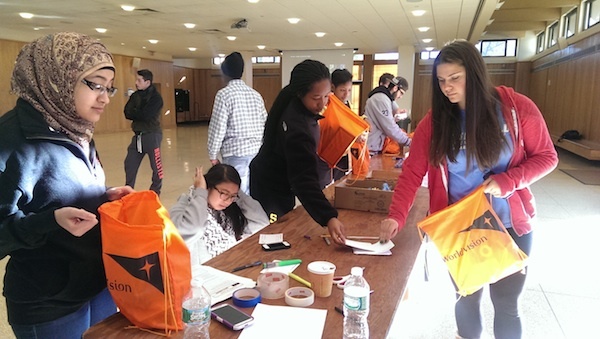 Fairfield Students Organize "To Swazi with Love"
More than 100 care packages were put together by Fairfield University students and sent to caregivers of people living with HIV and AIDS in Swaziland for a project called "To Swazi With Love." Chapter 2 1 And some of the believers were gathered together at Yale University, worshiping the Lord at the place which is called Old Campus. (It was on the twentieth day of February in the ﬁnal year of President Levin.) 2 Now there was a student, named Taylor, who had suffered a concussion. And the believers went to Vanderbilt (that is, the place where she was staying) to pray for her because she could not leave her room. (For she was sensitive to light and to noise.) 3 And hearing the voice of the Holy Spirit, one of them asked her, “Do you have pain in your knees?” And again he asked her, “How about the pain in your chest?” Now she had not told anyone these things and was amazed that he knew them. 4 And the believers, who were themselves students, laid hands on Taylor and prayed. And immediately she said, “I can breathe!” For the heaviness and pain was lifted from her chest. And the students prayed a second time, and her knees were also healed. 5 And when they had prayed a third time, the effects of the concussion completely left her. And the believers rejoiced in the Lord and testiﬁed of His goodness. 6 Now the believers departed because it was late, but two of them remained behind to talk with her and her roommate. And when they realized that one of those who had left also forgot his backpack, they waited for him outside on Old Campus. 7 But in their excitement, they began to testify about what had just happened to anyone who would listen. 8 And when he had come to get his backpack, the other believer remained. And the three of them went about sharing the good news until the fourth hour of the morning. 9 And many experienced the love of Christ through their witness – both believers and non-believers. For it says, a“Here there is neither Greek nor Jew, circumcised nor uncircumcised, barbarian, Scythian, slave nor free, but Christ is all, and is in all” and b“In the last days it shall be, God declares, that I will pour out my Spirit on all ﬂesh.” 10 And some of the students prophesied. Some prayed for the ﬁrst time. Still others were healed from various ailments. 11 One of them who had difﬁculty hearing, when they had prayed for him, exclaimed, “Thatʼs so weird. My ears just opened!” Others were healed of sinus congestion, ﬂu symptoms, and headaches. 12 And the Lord was with them all. I want to let this account speak for itself. Therefore I will only say three things about it: 1) This account is entirely true. Every detail is factual. (2) I do not claim to be writing the authoritative word of God. Rather, my aim was to show the reality of the New Testament in our lives today. Regardless of the New Testament's archaic writing style, its content is still fresh and alive. I also wanted to emphasize that what happened to us that evening is very real and very Biblical. Sometimes it seems like things need to sound a certain way in order for us to accept them into our religious systems and beliefs. Similarly, we sometimes have trouble believing that miracles still happen in the same way that they did in the ﬁrst century A.D. I hope that this account helps us make the connection. (3) What happened that night is available to everyone. If He used us, He will use you. Be encouraged, beloved. © 2013 by Iʼnoli Hall. All Rights Reserved. Reproduced with written consent from the author. When Colby decided to attend Quinnipiac, he planned to finish an MBA and proceed to a career in the business pharmaceutical world. But God had other plans. Right before his freshman year, Colby perceived a call from God to go into pastoral ministry. After hearing the Lord’s leading Colby decided to continue with his business major but not go on for his MBA. I (Andy) met Colby last fall and immediately recognized his leadership gifting. I quickly invited him onto our Core team and have continued to walk alongside him as he grows as a minister of the gospel on campus. This year, Colby has been the first student to pioneer ministry in a new place—his dorm. What’s more, Colby has invited a group of missional freshmen to help him, with the vision of equipping them to plant new groups in their dorms. His Dana Hall Bible study is a perfect example of what we hope to see in InterVarsity New England—a student catching a vision from God for his sphere of influence, inviting apprentices to help him reach that place and together inviting those who don’t know Jesus to study the Gospel. God continues to bring students like Colby—passionate about the Gospel and ready to reach the campus!